SimpliVity thinks it’s time for a super appliance to take on many workloads now handled by multiple appliances and that’s what its OmniCube aims to do. The beauty of a data center appliance is that it can plug right in and start working with minimal configuration and heartache. But that simplicity is undercut once companies start deploying multiple special-purpose appliances to handle different tasks — WAN optimization, deduplication, backup, etc. SimpliVity says its OmniCube super-appliance will handle all that stuff. That means the data running the organization is already cleaned up, streamlined and compressed eliminating inefficiency, he said. The beauty for the mid-market companies that SimpliVity targets, is they don’t need to buy an array of other hardware. For these companies, the current range of IT gear — servers, storage switches, primary storage, back-up and deduplication appliances are too much, he said. “It’s too hard for these customers to both acquire all these things and train all the people to run them. OmniCube is designed to be run and maintained by the VM administrator. OmniCube initially supports VMware(s vmw) but will certify for Microsoft(s msft) Hyper-V(s msft) later. Big legacy IT providers talk up converged data center appliances but also have to protect their current product lines. Companies like Hewlett-Packard(s hpq), Cisco(s csco) and IBM(s ibm) are all pushing converged data center hardware but also have to keep selling their standalone hardware. OmniCube, on the other hand, is designed from the ground up to take on, manage and run virtualized workloads. 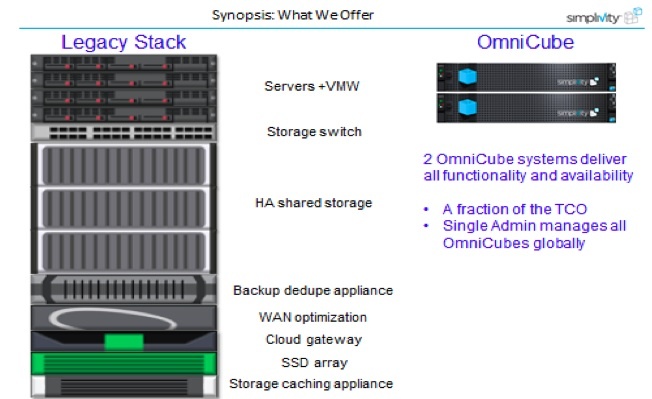 “Each OmniCube has 20 to 40 TB of usable capacity, 10 CPU cores and you can daisy chain up to 3 OmniCubes together. If you want to replicate across all your OmniCubes, you don’t need IP addresses, controllers or RAIDs, you just move that data or those VMs to your other OmniCubes wherever they are,” Kempel said. Along with the accelerator card, OmniCube comprises eight 3-TB hard drives and four 200-GB solid-state drives (SSDs) and the OmniStack software. And, for the many companies wanting to use public cloud infrastructure, they can put their OmniStack VM images up on Amazon’s(s amzn) EC2 as well. Mark Bowker, senior analyst for Enterprise Strategy Group, is intrigued. “There is an advantage in not having the big installed base — the big guys are all glueing their stuff together. This is simplified from the ground up. I like that it runs on X86 hardware and doesn’t involve a huge server-storage reference architecture. This is pretty easy–you slide it into the rack and scale it the way you want,” Bowker said. Westborough, MA.-based SimpliVity was founded in 2009 and is emerging from stealth with Monday’s OmniCube news. It has raised $18 million in capital from Accel Partners and Charles River Venture Partners. Kempel was VP and GM at EMC where he founded the company’s Media Solution Group. He went on to start up Diligent Technologies, a deduplication specialist bought by IBM in 2008. Kempel was also a major in the Israeli Defense Force’s Intelligence Corps. If, as many IT observers say, there is beauty in the simplicity of data center appliances, there may well be a lot of appeal — especially for resource-constrained mid-market companies — for one appliance that combines all their workloads. Looks like Souped up Nutanix!